I have a great giveaway for you this week! 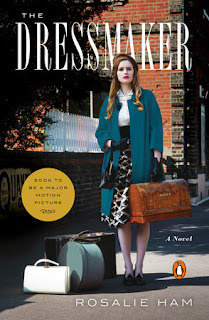 I'm giving away a copy of The Dressmaker by Rosalie Ham. According to the publisher: "This darkly satirical novel is a perfect fit for the dog days of summer: Ham sets her tale of haute couture and revenge in small-town Australia, where the nosy neighbors think they know all your business and don’t like any of it one bit." The main character is Tilly Dunnage, who left town many years ago but has returned to take care of her mother. The townspeople hate Tilly because they think she killed a boy back when she was a child. They also look down on her mother, whom they call Mad Molly. I'm only halfway through, but it's an entertaining story and has just started to take a dark turn, I believe. I'll write a full review once I'm done. In the meantime, you can win a copy of The Dressmaker by completing the Rafflecopter down below. Also, be sure to check out the movie trailer. The Dressmaker will soon be out in theaters starring Kate Winslet and Liam Hemsworth. This giveaway is open only to U.S. mailing addresses per the publisher's request. To enter, complete the following Rafflecopter by midnight Eastern time on August 18. The winner will be notified by email and will have 48 hours to respond before a new winner is selected.